For Sat Nav and online maps please use post code IP32 7BS. 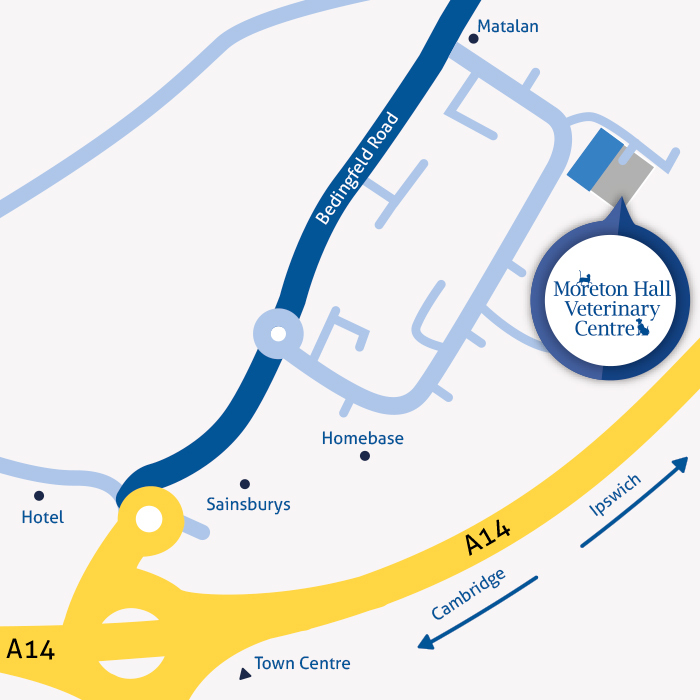 Moreton Hall Veterinary Centre is located on Boldero Road and is adjacent to Easlea Road. Our main entrance to the car park is easily accessible and easy to find. Take exit 44 to Bury St Edmunds East/Sudbury. Stay in the left hand lane and continue onto Bedingfeld Way. At the roundabout, take the 2nd exit and stay on Bedingfeld Way. Go through one more roundabout and turn right onto Easlea Road. Turn left into Boldero Road and we are just on your right.